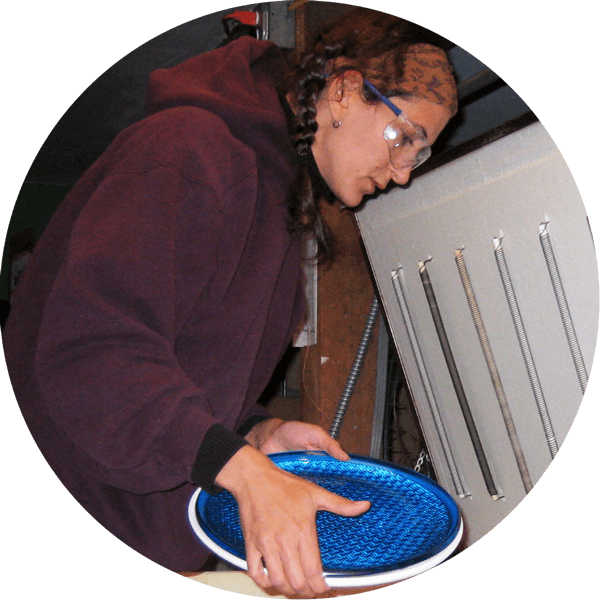 Recycled Glassworks specializes in the production of handmade, unique dishes and bowls. 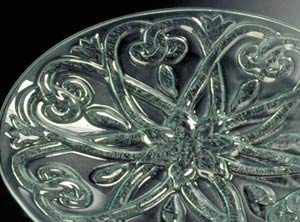 Every piece is cut from used window-type glass, and kiln-fired over molds that give them their new form, as well as a brand new life. I have always loved functional art that is not only great to look at, but also enriches your day-to-day routines. 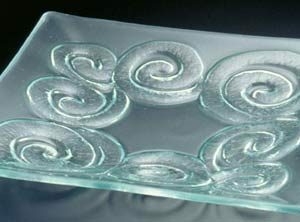 In 1996, I started Recycled Glassworks because glass is a wonderful material, both for re-use and for tableware. My work does not consume any brand-new materials (even my packing materials are reused). Yet the resulting dishes look look new and fresh. Plenty of glass exists already; it does not degrade over time. Bottle glass has an established recycling infrastructure. Plate glass, however, ends up in landfill, unless it gets upcycled into a second life. I hope you enjoy the unique tableware of Recycled Glassworks as much as my customers and I do. Most of it is window glass that I get from contractors homeowners doing renovations or demolition. The dishes & bowls are made from ¼-inch thick, non-tempered plate glass. Sometimes I get old shelving units or tabletops to work with. What tints or types are available? 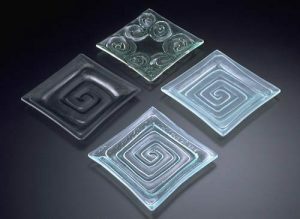 This picture illustrates the four types of glass types I produce. However, some designs are available only in one or two types. Please see the descriptions next to the product pictures throughout this website. I put my handmade dishes in the dishwasher all the time and have not broken one yet. I advise my customers to skip the ‘heat to dry’ setting. Large platters and bowls don’t fit in the dishwasher and should be cleaned by hand. Can they go in the microwave or the oven? The dishes and bowls can go in the microwave to reheat food. I recommend short settings (1-2 minutes), stir, and add more time if necessary. I don’t use them for microwave cooking, as microwave heats food unevenly. Long setting will create uneven hot spots that may cause thermal shock, leading to cracks and breakage. I recommend not putting glass dishes in a regular oven. They are sturdy, but they are not Pyrex. The uneven heat from the hot metal rack may cause thermal shock. What about the green/blue color? All window glass has a bit of an aqua tint in it. Maybe you have noticed this color when looking at the edges of glass shelves or table tops, when you look at the edge? We just do not see it when looking through windows. The way in which my designs are raised into the glass brings out the natural color of glass. Are your pieces food-safe? Any lead? Yes, dishes made from window glass are safe to serve food on. 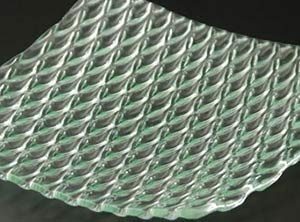 Since glass is a non-porous material, it does not interact with food, unlike other materials (plastic, Styrofoam). Is it easy to eat from the surface the designs create? The design creates a subtle ripple on the eating surface of the dinner plate. 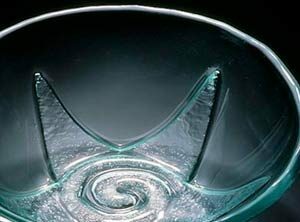 There is a shallow sunken spiral that liquids will ‘pool’ in. But the actual designs are impressed into the underside of the piece. 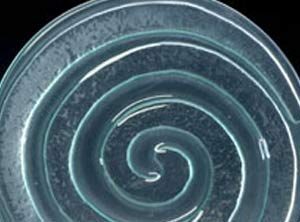 The Spiral dinner plates are quite nice to eat off of. 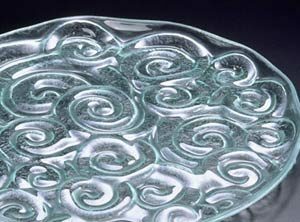 Some of my designs (Whirlwind, Baroque, Lotus) raise the surface a bit more, for a dramatic effect, but these are only sold in larger sizes as serving platters. The majority of my customers are return customers. Many of my customers start out with one piece and dicover how durable they are. Then continue building full sets of dishes. Can I order right from this website? Yes, you can. While the website shows most of the designs and sizes of the tableware I create, it may still be a good idea to talk by phone about availability, shipment and payment. Each piece is handmade, no mass-production factory here. Shipping: what are the times and cost? Ground shipping usually takes up to 5 business days. For single items, or shorter distances, shipping charges are between $10-$15. For $20, I can ship an order of multiple items (ie: a set of 4 dishes) cross county. For larger orders, or orders going to more than 1 address, I charge $15 per box. Air shipping can be arranged for faster delivery, and the cost will be passed on to the customer. This method of shipping has become quite expensive, running from $30-$40 per box. How about visiting your studio? My studio is located in San Francisco. If you would like to select your own pieces, save on shipping, or browse through my ‘seconds’ looking for a bargain, you are welcome to come to my studio. I have some glass. Can you take it? We are a drop-off recycling facility for plate glass, the type of glass that windows, shelves, doors, and tabletops are made from. To arrange for a drop-off, please call ahead for an appointment. Why don’t recycling centers accept plate glass? 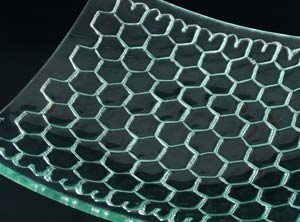 Glass expands and contracts as it gets heated and cooled, like water. Different glass expands at different rates. To aid in recycling, all bottle glass has been standardized on the same “expansion coefficient”. Window glass has not been standardized (it’s been in houses for decades). Adding it in with bottle recycling would cause stress fractures. 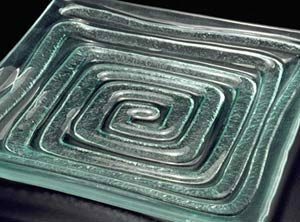 In my work, each dish or bowl is made from one piece of plate glass and heats/cools without problem.